Backyard and Beyond | Explorations of a newbie to the Pacific Northwest. Explorations of a newbie to the Pacific Northwest. This post is somewhat moot as I have obviously NOT blogged for a few months now. My friends have mostly migrated to FaceBook. More folks see your photos and whatnot there … not necessarily because they want to but because they happen upon them while they’re busy doing other things (to paraphrase JL). Very clever on FB’s part. And I confess, I enjoy the accidental findings myself. So this is just an acknowledgment of my limbo status. I like to photograph. I like to write. But for whom? And for what purpose? I was either hosting vacationers or being on vacation myself for the month of July. I am currently recuperating from bunion surgery early in August. August is a great time to recuperate. 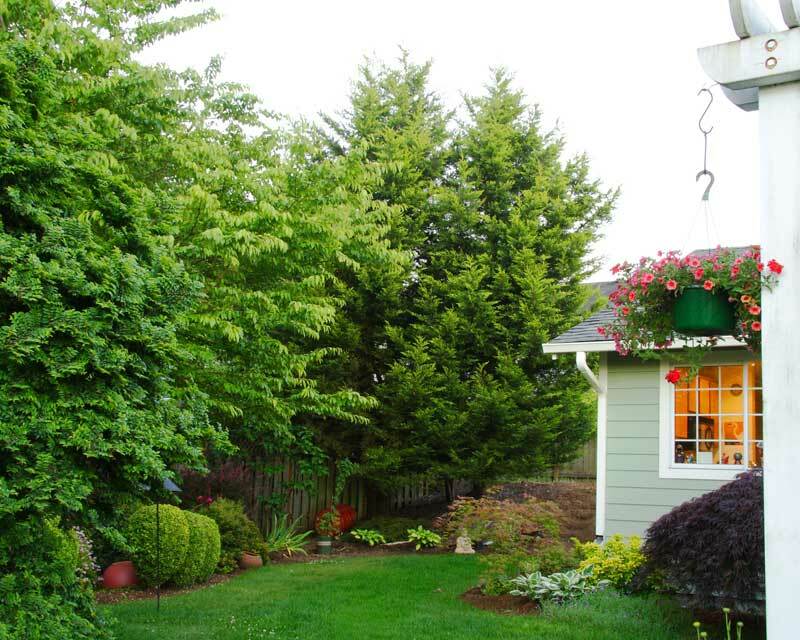 I can be outdoors and savor the smells and the breeze in the trees. The bees are busy doing their business. The flowers are making nectar. Life is good. I’ve been enjoying this blog lately: No Direction Known A young woman is cycling across the USA for LivingStrong. It’s a great way to “pass through” rural America. I just finished listening to The Help in audio book form — which I highly recommend for the outstanding narrations and accents. You can listen to an excerpt here. I guarantee you’ll fall in love with these women. Lastly, I’m reading Temple Grandin’s Animals in Translation and enjoying it immensely. 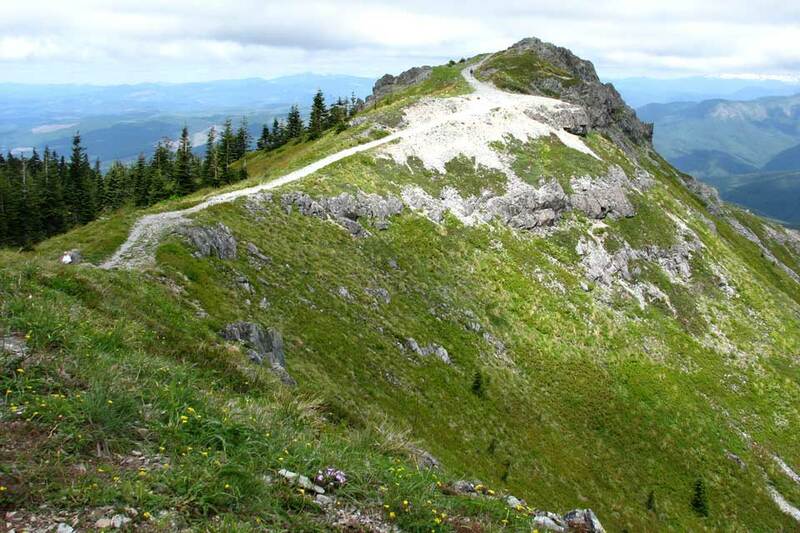 Silver Star Mt. 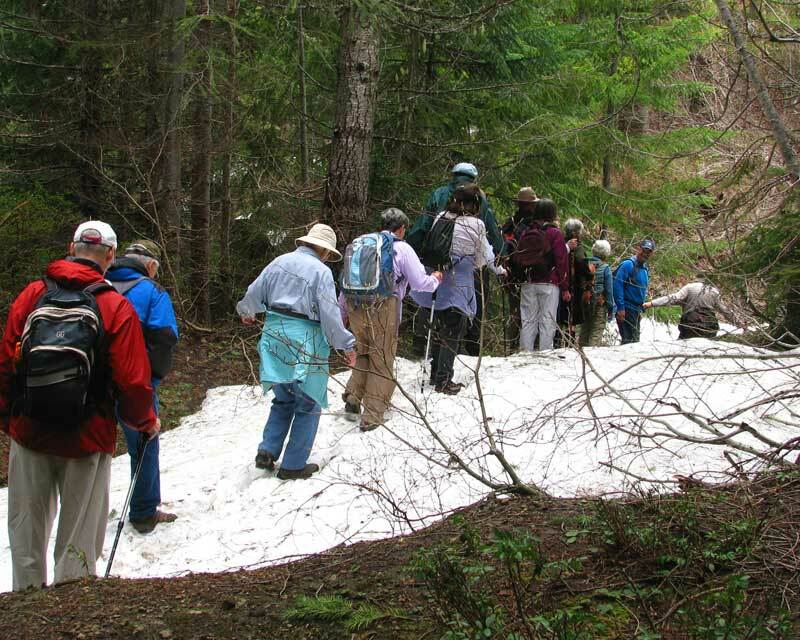 hike provides the quintessential hiking experience in the SW Washington Cascades! The Forever Young Hikers of Clark county were at it again. 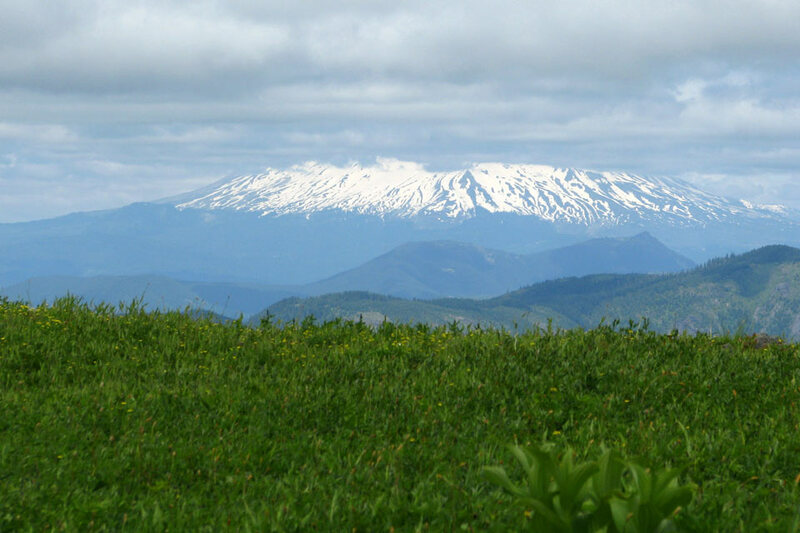 This hike affords outstanding 360 degree views of 5 volcanos (St. Helens, Rainier, Adams, Hood and Jefferson) … on a clear day. We saw the bases of all but Mt. Jefferson. 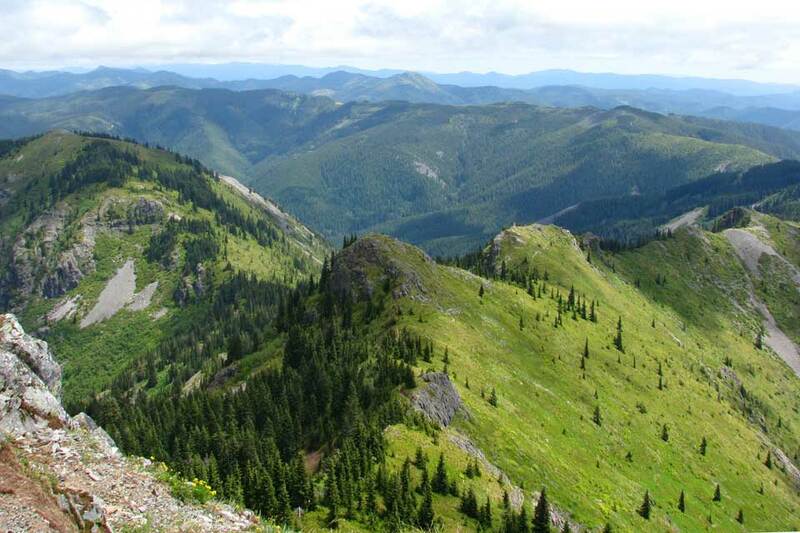 Besides stellar views, “The Sound of Music” landscapes and dozens of vibrant wildflowers this peak is quite conspicuous on the eastern ridge-line from Vancouver and Portland. The hardest part of this trek was getting there! The last 5 miles was a deeply rutted, winding dirt road. We approached from the North, at trailhead #180 (elevation 3,175′). It was about 3 miles to the summit with a 1,200 ft elevation gain. The incline was steady and relatively easy due to the broad trail. The loose rock trail bed kept all eyes on the ground when walking. The clouds broke up a bit as we reached the summit. It is hard to visually convey the exhilaration of the exertion, the vast open space, the heights and power of wilderness. This view is looking east from the summit trail. 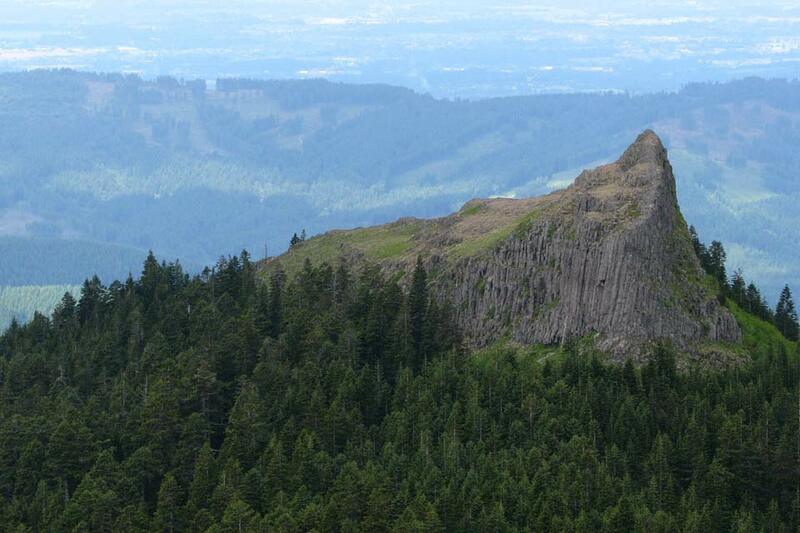 I believe this is Pyramid Rock (looking west). Again, but for the cloud ceiling we would have seen the volcanoes. 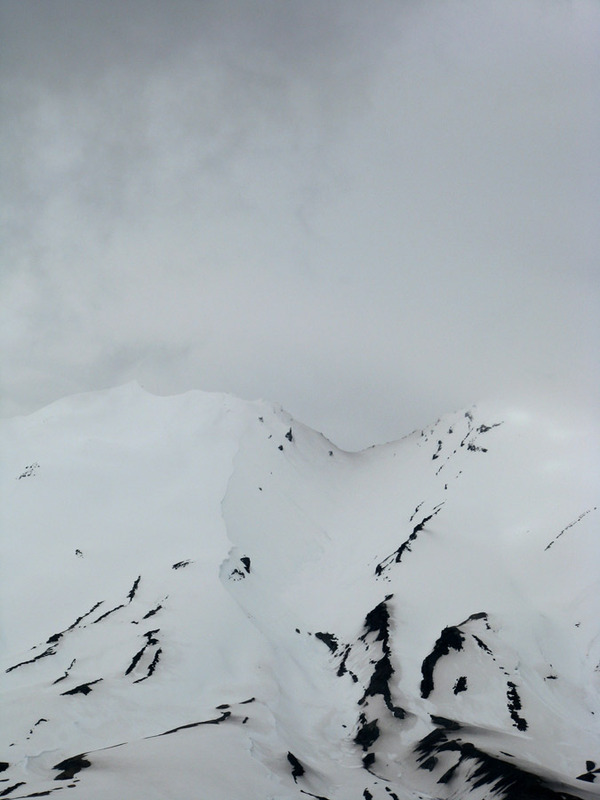 This is the most we saw of Mt. St. Helen’s. 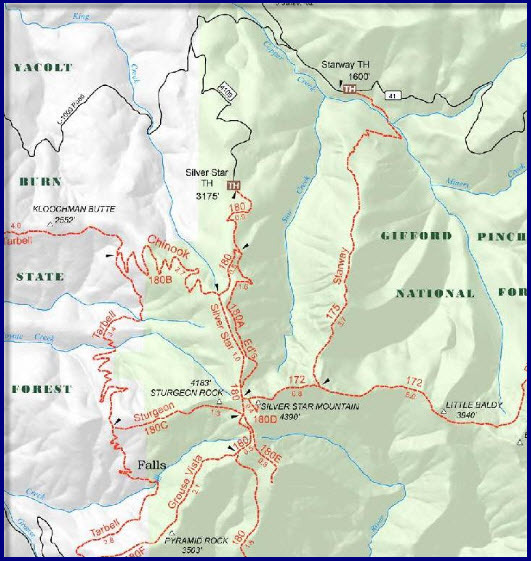 Below is an awesome shot that demonstrates how Silver Star got its name … I’m told from the star-like junction of five ridges. The western ridge is bordered by the Yacolt Burn area, which is now a state park. 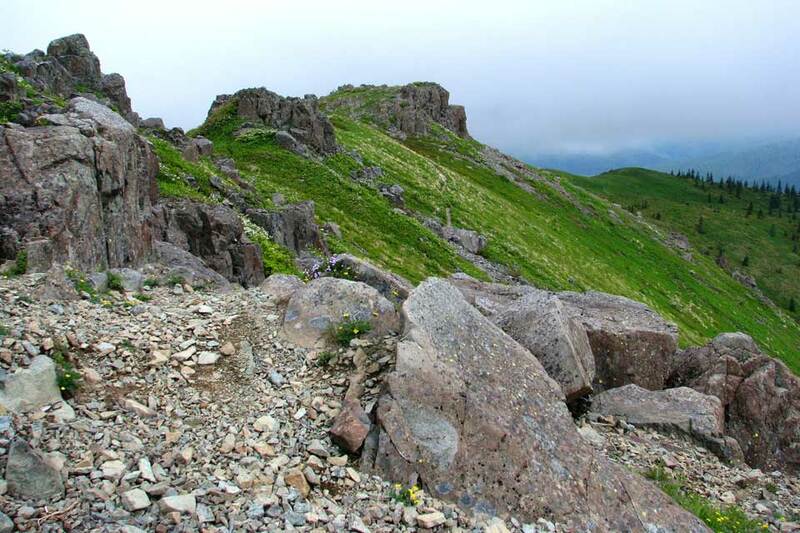 Trees were not replanted and the western slopes remain treeless — but densely covered in shrubs and wildflowers. Speaking of wildflowers, we counted 50 (20 less than last year’s count) and it was clear that with this year’s cool wet spring has delayed the peak bloom at this elevation. 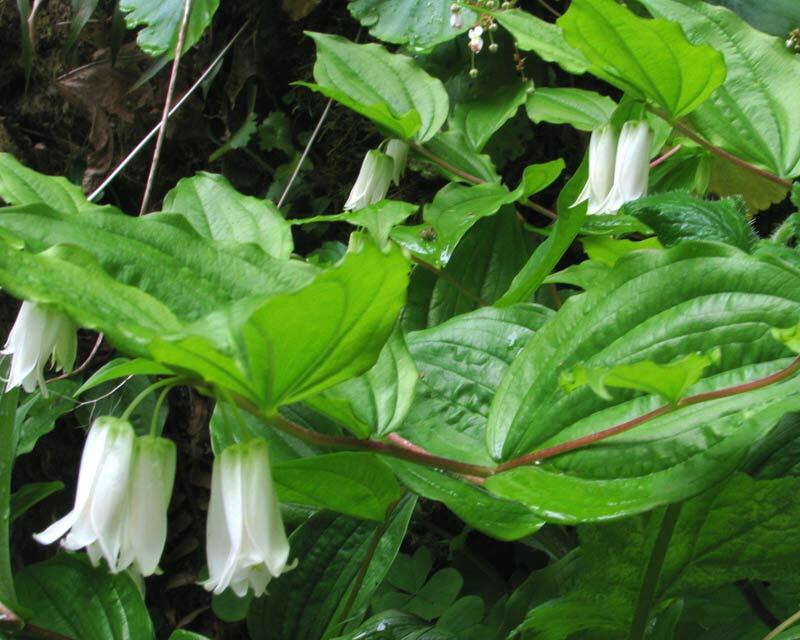 We saw bear grass, penstemon, golden pea, iris, phlox, violets, service berry, columbine, paintbrush, Sitka Valerian — and on and on! Gentian was everywhere but not yet blooming. 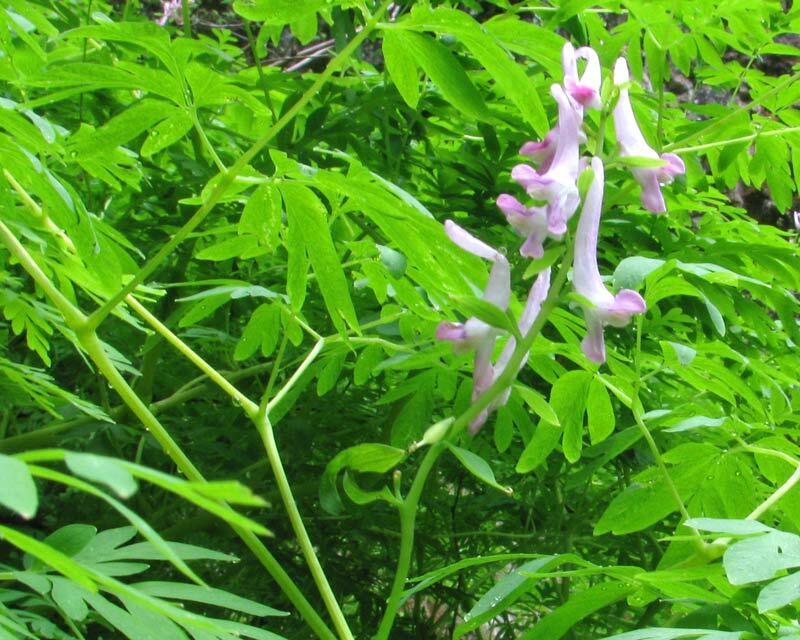 This USGS link illustrates some of the most abundant wildflowers. 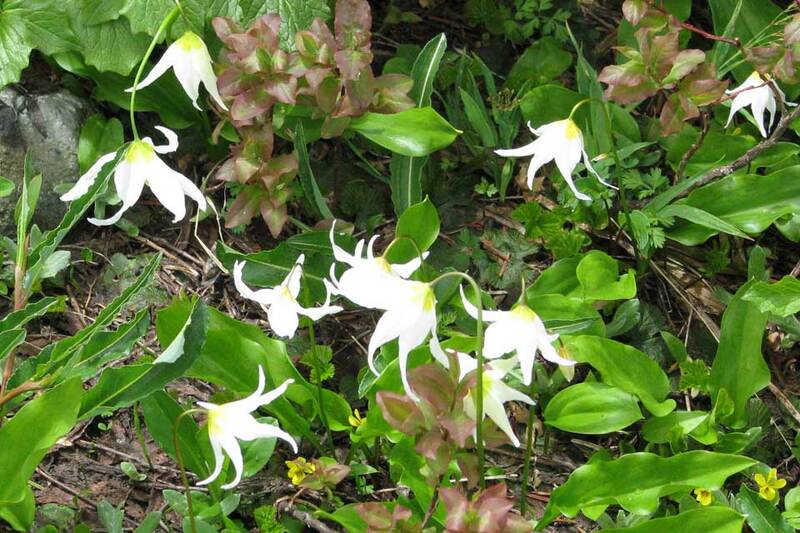 The Avalanche Lilly was especially profuse. My brother Tom and I tend to talk on the phone in the evenings and compare dusks. He’s in Ojai, CA. Up here at the 45th parallel, dusk is a prolonged affair. I attempted to take timed photographs to illustrate the point. 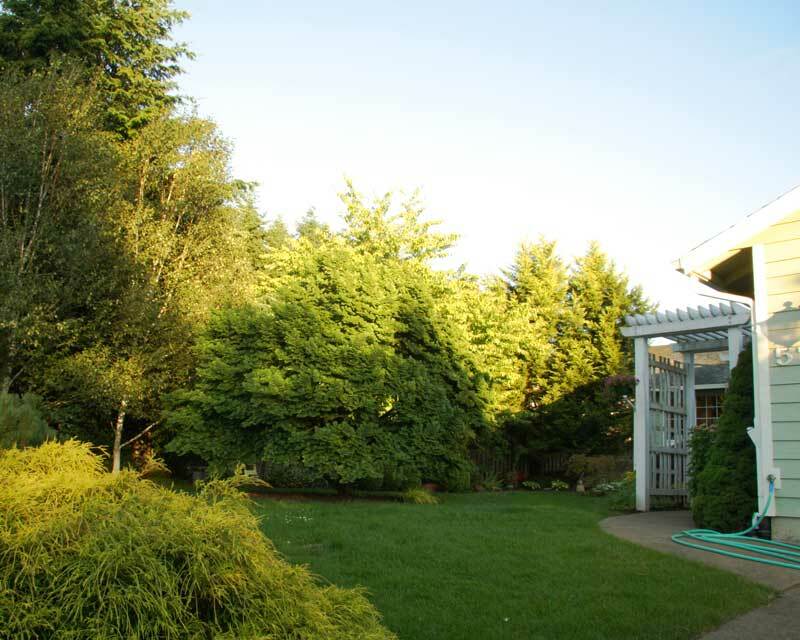 Of course this is very haphazard … exposure times varied, etc. I tried to pick photos with the least distortion. At 8:15PM there is still lots of bright light on the trees and higher ground/objects. At 9PM the sky is still quite light and there’s lots of visible color. 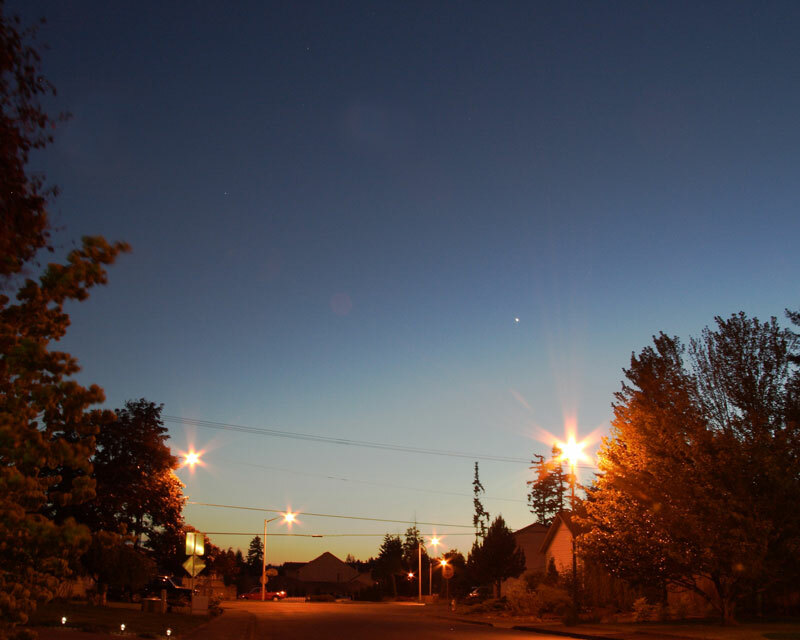 By 10PM it’s a very dark dusk … with some western light still visible in the sky. The intrepid 50+ hikers were off again. 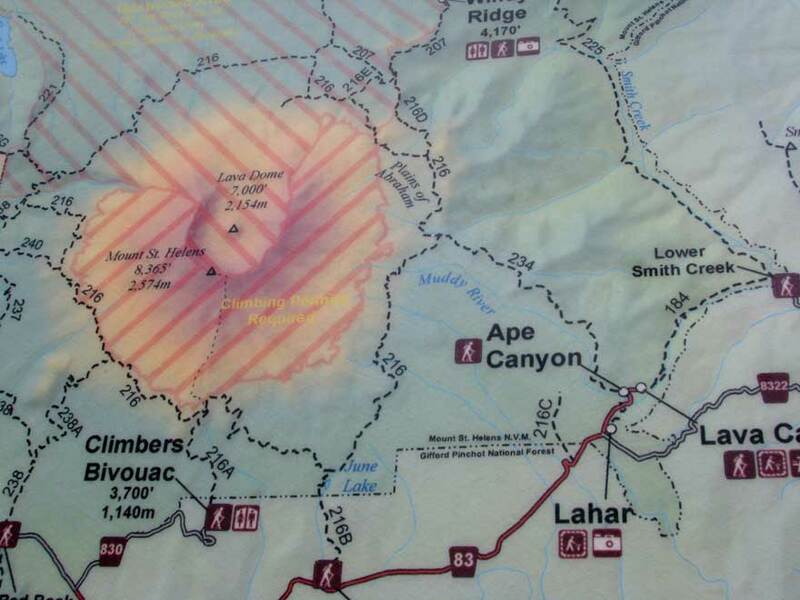 We hiked the Ape Canyon and Lava Canyon trails at the base of Mt. St. Helens (MSH for short, hereafter). MSH was right in front of us, but with the overcast skies it was hard to appreciate her majesty. We only went about 2.5 – 3 miles up the Ape Canyon trail. The elevation gain was gradual so we weren’t too miserable. We only came upon snow at one sheltered ravine. The real thrill of the day was after lunch. 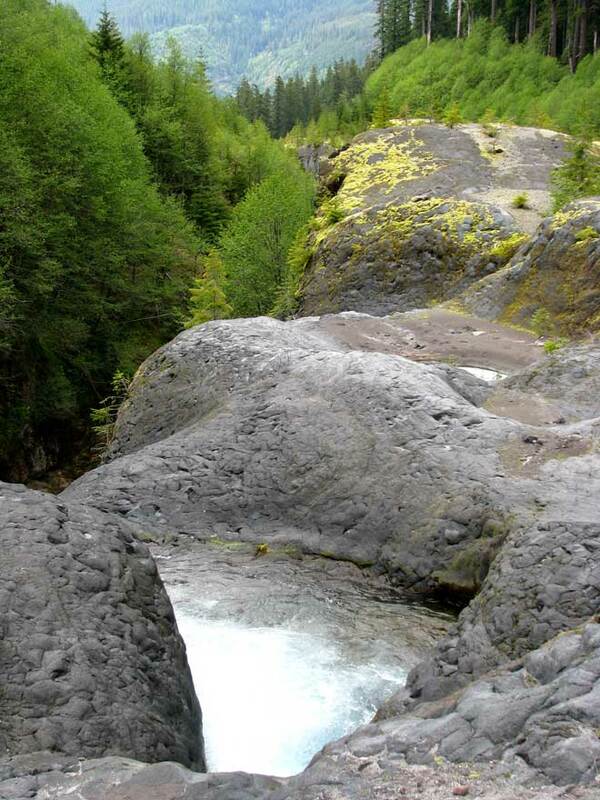 The Lava Canyon trail isn’t visible from the road, as the approach is from the top. The falls drop 200 feet down and away from you. 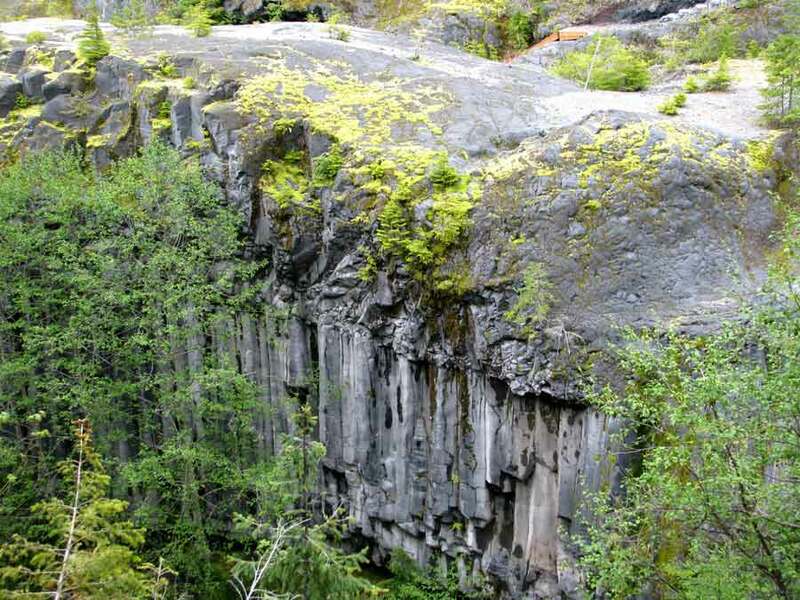 Apparently this dramatic canyon was buried in ash and dirt for some 1,800 years and was only exposed as a consequence of the MSH eruption on May 18,1980, when a mudflow scoured this valley free of topsoil and forest to reveal the ancient basaltic andesite lava flows. This website has an awesome slide show of the canyon. As breathtaking as this was … the real thrill was yet to come. 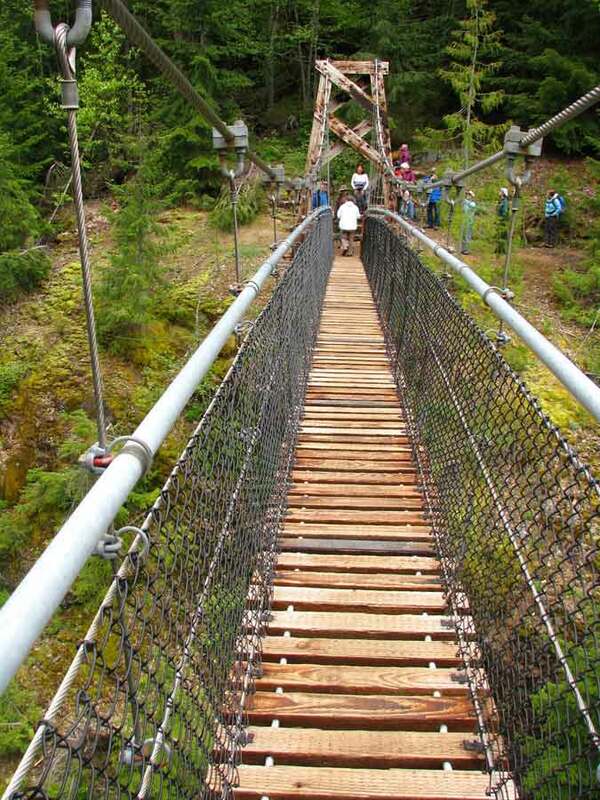 About a 1/2 mile down river from the falls is the “bouncy, lively” suspension bridge. It’s only 3 ft wide and 100 ft across. There’s quite a lot of wiggle as you go over. Of course, it affords a great view of Muddy River. It was as thrilling as any roller coaster. Sahale Bridges built the bridge in 1993. Their website has terrific photos and even a video of crossing the bridge. The foul weather has driven me indoors. I was reading Dr. Mark Hyman’s Ultra Metabolism (again) and noticed he seemed to be big on amaranth. I only knew it was a tiny grain and was sure I didn’t like it (without ever tasting it). 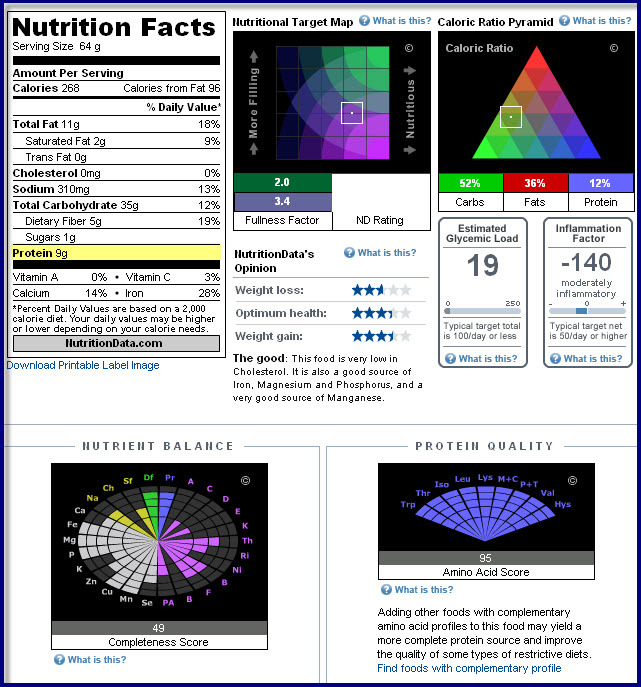 I use a really cool website to track the nutritional value of foods — aptly named Nutrition Data. You can just look up foods or create recipes. You can create diet plans and track total daily nutrition. Best of all, it’s free! Here’s the analysis of my amaranth porridge (with tahini). Yep, that’s 9 grams of protein (even without the tahini). That’s more protein (and lower glycemic load) than any other breakfast cereal out there. Soak 1/2 cup Amaranth over night (or longer). Drain. Cover with 1 1/2 cup water and 1/8 tsp salt. Bring to boil then lower heat and simmer slowly for 20 minutes. Stir every 5-8 minutes. Lower heat as needed. It tends to stick to the bottom of the pan. (I add a dash of olive oil to mitigate pan stickiness.) Stir to break up any clotting or pan bottom sticking. Cover when done (water is absorbed) and remove from heat. Makes 2-3 servings. Condiment options: tahini, molasses, maple syrup, roasted almonds, coconut, etc. This is the first time in the two years I’ve lived here that it has rained nearly non-stop, during the day … real rain … like, heavy raindrops … for over a week. There are pools of water everywhere! This image off my back porch illustrates why I’m hiring “drainage experts” to pull the water away from my home. Tsk! Tsk! 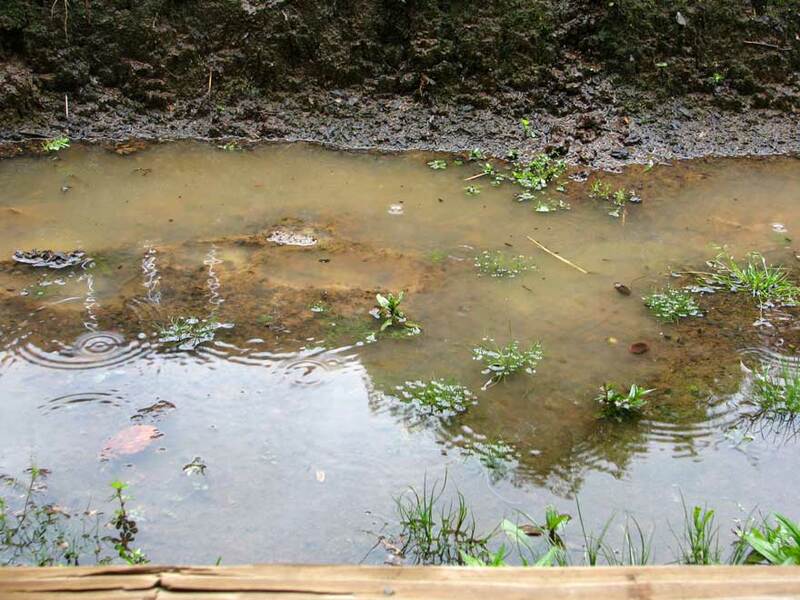 Home was built in 1989 … apparently before drainage regulations were in place. I’d been babying little tomatoes I bought in 4″ pots and stair-stepped up to 1 and then 5 gallon pots. I took them off the porch just before the deluge started. Chances are they’re “shocked” past redemption by now. 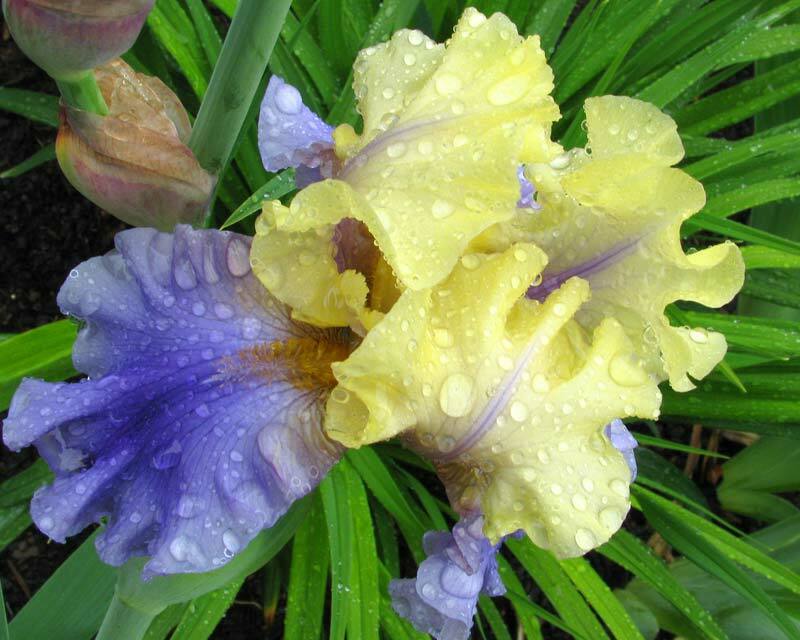 Irises on the other hand, are like ducks. They’re perfectly happy in the rain! 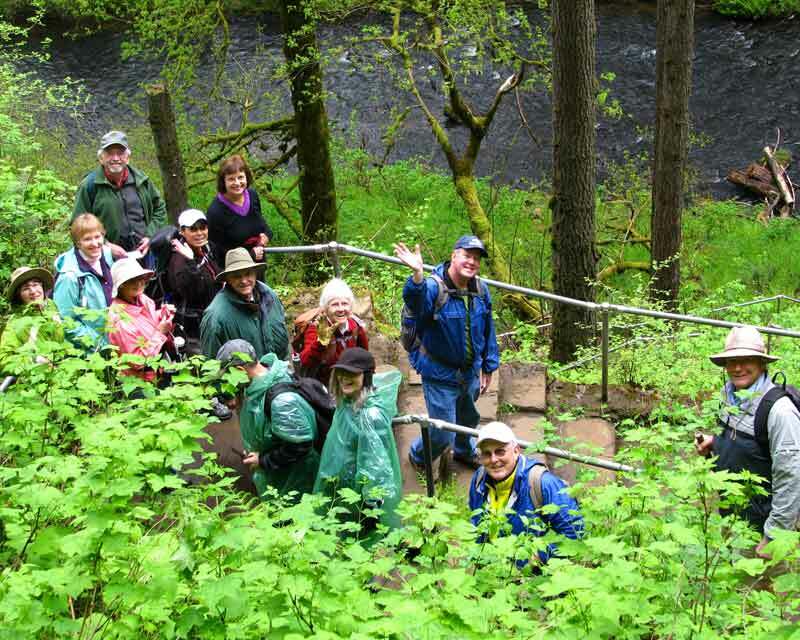 The Forever Young hikers went to Silver Falls state park in Oregon. It made for a great hike. Read about the curious history at this post. With so many falls I couldn’t help but think of Ronald Reagan’s infamous quip, “Once you’ve seen one redwood you’ve seen them all.” There were at least ten falls and photographically speaking, once you’d seen one … well, enough said. 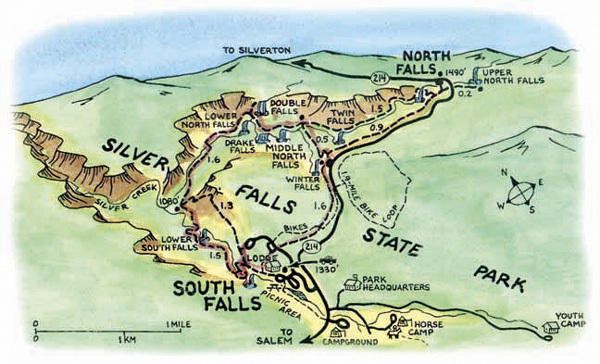 We started at North Falls. Click on the image to enlarge and see the trail that goes under/behind it. It has to be said that the geography of the area is spectacular. The water pours over these massive lava “shelves”. 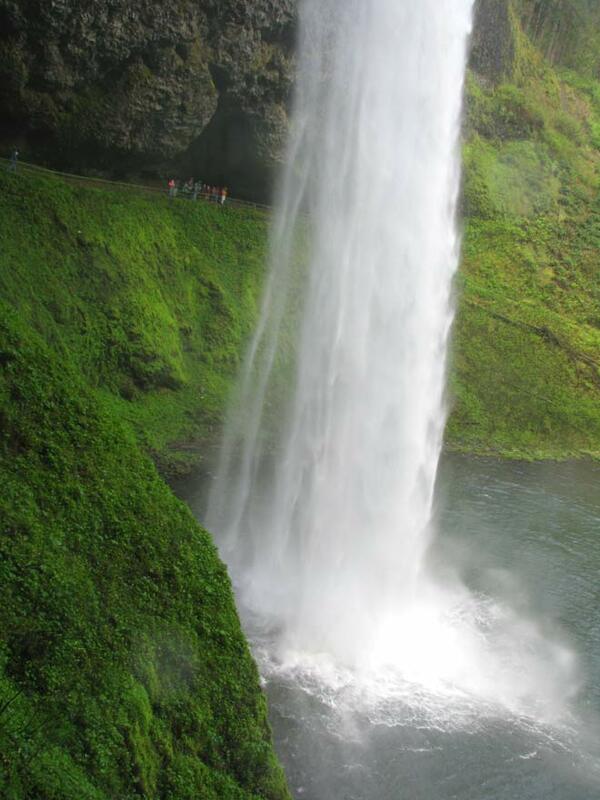 The force of the water has carved out enormous hallow caves underneath which allow for trails. Here’s a view from under the falls. All those negative ions recharged our batteries. You can just barely make out a group of hikers on the cave trail just to the left of the water column. Again, we have FDR to thank for putting the CCC to work restoring the area. 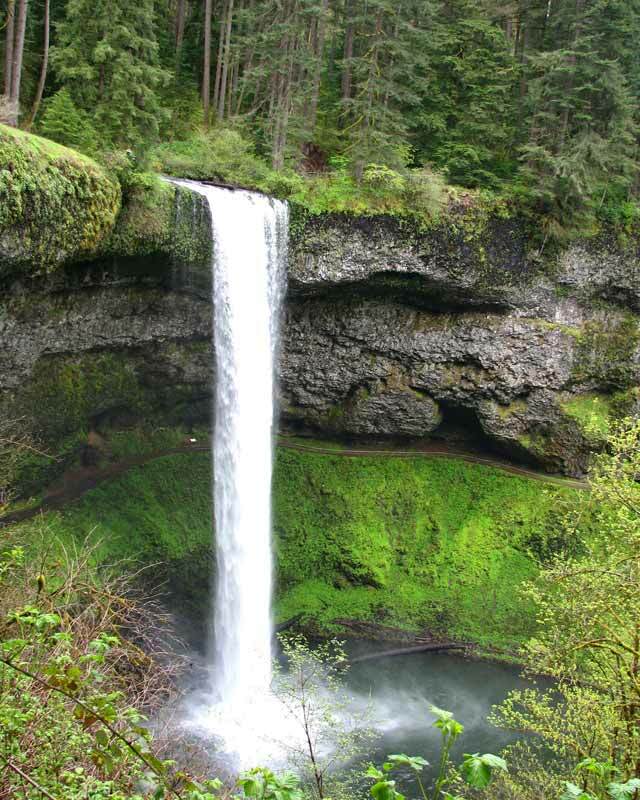 It’s now the largest state park in Oregon. 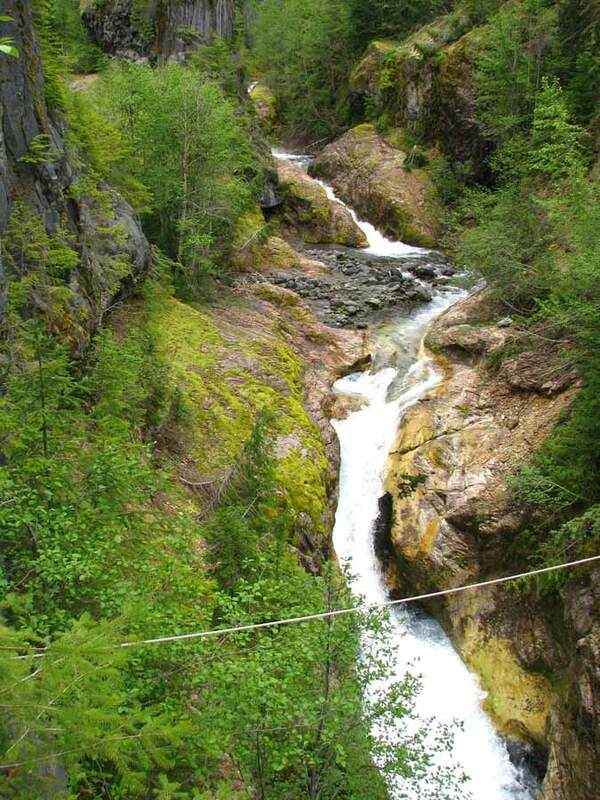 Other falls came in all shapes, heights and sizes — from broad and flat to wispy, slithery streams over moss-laden rocks. A word of caution at this time of year — pay attention! Portions of the trails are steep and slippery. With all the shade and misting from the falls the wildflowers were robust! The moist rock walls were covered in cascading sedum and saxifrage. There were trillium, delphinium, mosses and ferns. I discovered an awesome Pacific NW wildflower site at Turner Photographics. These hikes bring out the kid in me. The easy socializing and conversations. Meeting new people. It’s like being on the playground in first grade. All the planning and driving is done by others — often to places I’d never heard of (being a newbie and all). What a deal for $16! I’m having a ball. I was thoroughly (and happily) exhausted by day’s end.